Ask The Super Strong Guy: How Do I Bring My Deadlift Back To Life? Getting over a deadlift sticking point requires a strategy. The best way is to attack it with isometrics, but not just any type will do. I've been deadlifting for a couple of years, practicing my technique so it's solid. My gains have plateaued and I was wondering the best way to jump-start strength gains again. If you're looking to super-size your strength, it's inevitable you'll end up doing deadlifts. What's also inevitable, sooner or later, is that you'll hit a sticking point in which further gains seem all but impossible. 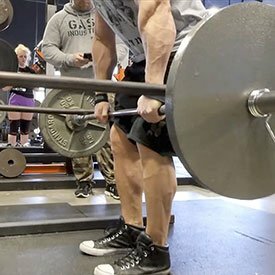 As many coaches and big-time deadlifters will tell you, deadlift-specific isometrics are worth their weight in gold if you have a specific deadlift sticking point. Isometrics are a technique in which there's muscle contraction, but no movement in the angle of the joint. It's more or less like you're lifting a weight that's so heavy you can't move it. But with isometrics, you're capable of recruiting more muscle fibers for a longer period of time, in your weakest spot in the range of motion. This is why I call them deadlift sticking-point destroyers. The complaint against isometrics is their localized strengthening effect, meaning you build strength only at the angle you're working. But a sticking point is a localized weakness, so you're attacking the problem right where it's needed most. However, I'm not a fan of every way that isometrics are done. Let's look at the three most common. A common way of training isometrics in the deadlift is with eccentric-pause deadlifts. 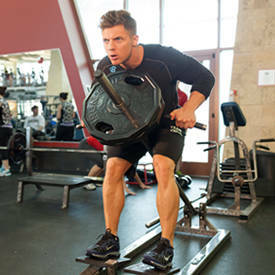 This simply means that as you lower the weight, you stop at the sticking point and hold the loaded barbell in place for a specified amount of time. Once completed, lower the barbell to the floor. This technique is a poor choice in my experience, for the simple reason that I haven't seen any transference over to the concentric-only action of the deadlift. Score: Poor. This is a more effective method than yielding isometrics. Simply pick up a loaded barbell and stop at the sticking point you're working. Hold the weight for a specific amount of time, and then lift the barbell to completion. I find this is especially effective for football players, rugby athletes, and those who apply maximum force moving forward. It's also better because the deadlift is a concentric-only movement and you're not giving ground; you're holding ground. There's still one flaw here, though: You're not applying supramaximal levels of force during the isometric contraction. If you were, the barbell would be moving! Your force production at the isometric is just enough to keep the barbell in place, which means you're not getting as much strength-building stimulus as you could. Score: Better. To truly defeat a sticking point, you need to grab it by the balls and kick the living crap out of it! The best way to do this is to perform deadlift isometrics against the pins, set at your sticking point. But don't just pull—pull as hard as possible from the floor for six grueling seconds. You want to try and bend the bar and break the safeties. After this, rest two minutes then deadlift a submaximal weight as fast as possible for a single repetition. In research, isometrics in this style have been shown to recruit 5 percent more muscle fibers than either concentric or eccentric training. This could lead to greater force production, while allowing you to sustain maximum tension for a much longer period of time. Also, a 2002 study found that isometric action training led to strength gains of 14-40 percent after 10 weeks. Done right, isometrics are the ultimate sticking point remedy. The physiological training effects are on your side and of equal importance in the central nervous system programming. You're teaching yourself to aggressively hit the gas and run those sticking points over! Score: Best. 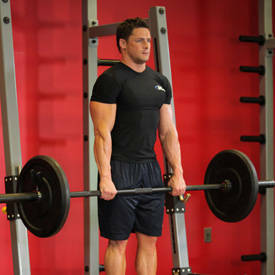 Start the movement from the deadlift starting position (not the sticking point). Pull as hard as you can for 5-6 seconds. Wait a couple of minutes, then do an explosive submaximal full-range deadlift. Use isometrics for 6-8 weeks, then go back to your regular training. Listed weights are of your current 1RM, or single-rep max. To compute, multiply the percentage by your 1RM, or use this formula to estimate. Attempt a max barbell deadlift without isometrics. Babault, N., Pousson, M., Ballay, Y., & Van Hoecke, J. (2001). Activation of human quadriceps femoris during isometric, concentric, and eccentric contractions. Journal of Applied Physiology, 91(6), 2628-2634. Kubo, K., Kanehisa, H., & Fukunaga, T. (2002). Effect of stretching training on the viscoelastic properties of human tendon structures in vivo. Journal of Applied Physiology, 92(2), 595-601.